Amsterdam. On 27 December 2012, Gaybar Bump was be forced to close its doors. 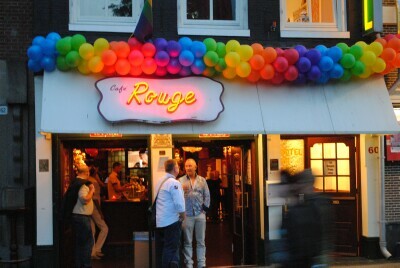 As a result, there are no less than Amsterdam eight gay bars that closed their doors in 2012. Do not forget the various closures of the gay bars in the Reguliersdwarstraat years before. Several of the recently closed bars are only two years old, but had many problems at startup, in getting necessary permits and also to stand to the new gay culture. The golden age of the eighties that gay crowd went to bars and having fun is gone for good. Who remember the many theme parties in April, the evenings in Havana, the Exit festivals and performances at Club iT. Amsterdam has no longer the title of gay capital they once had . But also in other places gay bars closing the doors. Are gay bars not attractive enough or are they located in the wrong place? Or are many gay men afraid of the gay violence on the streets? In recent years, gay men fight to have many rights, including gay marriage. This seems like that many gay men think that they no needs gaybars. The gayprides in Amsterdam in recent years are rather a carnival parade and a wrong party ,than a place where gay rights are defended. The latest homophobic statements of Pope Benedict XVI have just shown that gay rights are not absolute. In large cities such as Paris, London and Berlin, the gay bars are still fully present with a wide range of venues. Now a gay bar in the Marais, can not be compared to a bar in Soho London or Berlin Kreuzberg. Every gay bar has its own style and audience. But Gay Amsterdam is not yet done. The Hard scene in Amsterdam is doing just that good in the Kerkstraat and Warmoesstraat. And in early 2013, the have their own gayfestival. To be continued in 2013. Cafe Rouge in beter times.